New HP Jet Fusion 300 / 500 Series enables engineering-grade functional parts in full colour, black or white. HP Inc. has expanded its 3D printing portfolio in Asia Pacific & Japan with the introduction of its new Jet Fusion 300 / 500 series of 3D printers, the industry’s first 3D printing technology to enable manufacturers to produce engineering-grade, functional, parts in full colour, black or white – in a fraction of the time of other solutions. The Jet Fusion 300 / 500 series will allow small- to medium-sized product development teams, design businesses, entrepreneurs, universities and research institutions to access HP’s industry leading Multi Jet Fusion printing technology. The new Jet Fusion 300 / 500 series complements HP’s existing industrial-grade Jet Fusion 4200/4210 3D solutions which deliver the lowest cost per part and are designed for manufacturing environments. By building out its portfolio, HP is providing users of its Multi Jet Fusion products the ability to prototype and produce new designs and applications on the same platform. The new Jet Fusion 300 / 500 series of 3D printers has a compact design, enhanced workflow solution, and the world’s first integrated and automated materials delivery system allows for greater unattended operation, ease of use, and dramatically increases production efficiency and output. The Jet Fusion 300 / 500 series also supports the three leading color file formats (OBJ, VRML, and 3MF) enabling the world’s designers to reliably and easily produce the parts they want without the inconvenience of file conversion or data corruption. 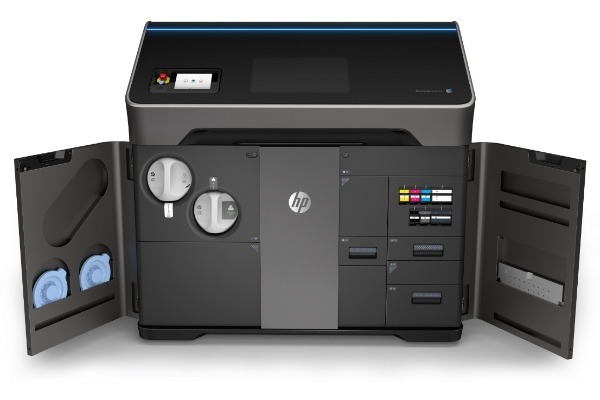 The HP Jet Fusion 300 / 500 3D printers will launch with a new material HP High Reusability Color Boost PA12. Parts using this material will have mechanical properties similar to the HP PA 12 material from the Jet Fusion 4200/4210 solutions.